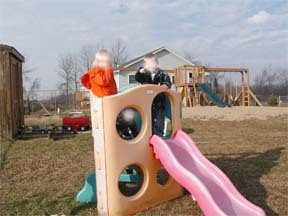 Playing at Day care helps children explore and learn about their world in a safe environment. We have exercise videos with Elmo we watch on days it is raining. We also have tents and tunnels. We sing and dance along with our children’s CDs. Please keep your laughter to yourselves when you see. We do stretches and balancing on balls. Stretching will help reduce stress. We talk to the children about what stress is and how it affects the body. Children need to be taught how negative feelings can be felt physically. When dancing children learn to express themselves physically, to be conscious of the moods and rhythms of music, and how to balance and be coordinated. While playing on the riding toys and climbing on the climbers children practice balancing, and coordination of legs, body and arms. They use imagination, pretending to be other things. They learn to use energy in constructive ways. They also practice taking turns and problem solving. Their self confidence grows each time they do something on their own. Playing is physical activity. Have you been on a swing lately? I admit I am out of shape. I was on the swing with the kids for 5 minutes and was tired. I now have a bike and ride with them too. Just playing chase can be exhausting. We encourage the kids to pay hard. Playing is important to children because they are growing in social, emotional, physical, cognitive, and language development. Socially they cooperate, share, negotiate, and develop patience and tolerance. Emotionally the gain self confidence, express ideas, and develop a sense of accomplishment. Physically they are strengthening their hands, fingers, and coordinating their eyes with their hands. 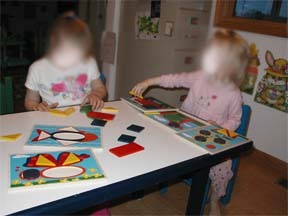 Cognitively children are starting to explore basic science, shapes, numbers, size, and gravity. Language is developed while talking and listening to the other children and teachers. Some things sink while others float. Concepts like empty, full, volume, and weight that later will be used in math.